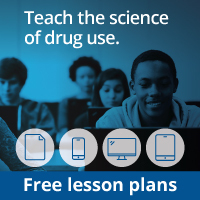 Encourages people to test their knowledge about drug use and addiction by asking them to take a 13-question quiz. Accompanying answers shed light on the science of drug use. NIDA. "National Drug & Alcohol IQ Challenge." National Institute on Drug Abuse, 18 Jan. 2019, https://www.drugabuse.gov/publications/national-drug-alcohol-iq-challenge. NIDA. National Drug & Alcohol IQ Challenge. National Institute on Drug Abuse website. https://www.drugabuse.gov/publications/national-drug-alcohol-iq-challenge. January 18, 2019.